Lewiston resident Tonya Bailey-Curry lost her 21-year-old son Dante to suicide two years ago. Patty Wight reports on growing concerns about Maine's suicide rate. "I absolutely thought, you know, this can't be," Bailey-Curry says. "Maybe somebody murdered him. Just the thought that I would think that instead, like that's the better option. But just the thought that you could have a child who has unfortunately made a decision to end their own life, what does that say about you as a parent?" When Dante died, he left behind a family filled with grief and unanswered questions. As Curry tries to piece together what led to Dante's death, she remembers he changed some habits. He stayed up all night and slept all day. He cared less about his appearance. At the time those changes seemed small. But in hindsight, Curry says they were warning signs. "We talk about suicide as a reactive measure a lot, not as a proactive measure. I don't think we think about it as parents until it affects someone close to us or ourselves." The year that Dante died - 2013 - marked the highest number of suicide deaths in Maine in recent years - 245 people. 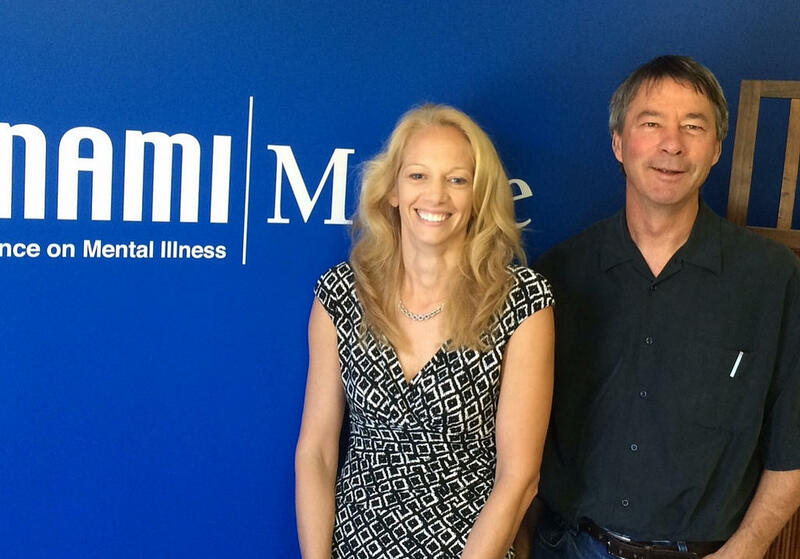 Jenna Mehnert, executive director of NAMI Maine, and Greg Marley, the group's clinical director. "Suicide in Maine reflects what's going on in the nation," says Greg Marley, the clinical director at the National Alliance on Mental Illness in Maine, or NAMI. "Since 2005, the numbers and rates have been on the rise across the country. In Maine over the past three or five years, we've had over 200 people a year." "That equals about every 1.5 days - so every day and a half, a Mainer dies by suicide," says Jenna Mehnert, executive director of NAMI Maine. For the past five years, the number of suicides in Maine has been higher than the number of fatal drug overdoses. And the two public health issues, Mehnert says, are connected. "Folks who are struggling with substance use are often self-medicating a mental health condition," Mehnert says. "And, in fact, the connection between the two is important. The fact that folks who have a mental health condition who haven't been able to seek help or haven't found the right help, then self medicate, which can lead to an addiction issue, which can lead to an overdose. So these aren't separate issues. They're interconnected." And they're preventable, says Mehnert. It's about knowing the warning signs, where to turn for help, and not being afraid to ask someone if they're contemplating ending their life. "Talking about someone's mental health is helpful - not 'plants a concept in their mind,' " says Winslow Police Lt. Josh Veilleux. Veilleux was able to prevent a suicide last March. His wife called him after she saw a man who stepped over a guard rail on a bridge in Waterville. When Veilleux arrived, he calmly approached the man. "I said, 'I'm going to kind of narrow it down: You're either up here because you're having relationship problems, you have substance abuse problems, or mental health issues,' " Veilleux says. "And he told me he was having relationship problems as well as substance abuse problems." Veilleux had taken a Crisis Intervention Training course where he was taught the importance of showing empathy. He told the man that his own uncle completed a suicide, and it broke his family apart. "And I just kind of begged him, 'Please, don't let what's happened to my cousin become of your daughter.' I said, 'I want to help you - I'll bring you to the hospital, just give me that opportunity.' "
After about 10 minutes, the man stepped back over the guard rail. "He had come in several days later, which was a huge shock to me. He came in to give me a handshake and a handwritten letter, thanking me for saving his life that day." Veilleux says he often meets families who are ashamed to talk about suicide. But he says too many people are dying from not talking about it. Learn more about the state of Maine's suicide prevention program.